Yale economic historian Garten (The Big Ten: The Big Emerging Markets and How They Will Change Our Lives, 1997, etc.) 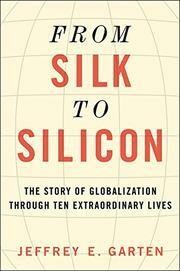 looks at 10 pioneers of the new global economy, from Genghis Khan to Deng Xiaoping. Of interest to students of economic history, though less intellectually compelling than David Warsh’s Knowledge and the Wealth of Nations (2006) or even Robert Allen’s Global Economic History: A Very Short Introduction (2011).